I feel like I've seen a lot of these now: expensive Mime Festival shows where the spectacle and technical ingenuity of some gigantic, indulgent piece of equipment overwhelms the theatrical, social or political intelligence that might, buried, lie underneath. Here, in Du Goudron et des Plumes, it's a floating, suspended stage, part-destructible, that can be made to swing heavily back and forth. Certainly it's a good box of tricks. No sooner has it been lowered than its occupants have pulled up the floorboards. Tall planks are slotted vertically in place and set tick-tocking back and forth, acrobats clutching the top like grasshoppers. Another two lengths, levered over a pole, support the giant, slow footsteps of a man in space. The top, the bottom, the inside are all used – many times, in many ways. Among a talented cast of five, Tsirihaka Harrivel's nervous, snapping body and intense, screwed-in face pulled all my attention; he's dark hero material, pained and driven. Given his level of activity in the show he is, also, quite obviously, the product of the same illegal genetic experiment that produced tireless supermutant João Paulo dos Santos. Watching Harrivel swing from the bars under the lifted stage, lit by cold light, you are watching beautiful, exceptional movement. But beauty is not what's missing here; if anything Du Goudron et des Plumes exhausts itself in its frenzied construction of images. It rushes from one thing to another, moving to each new scene by destroying the last (sometimes literally). At it's best, and from time to time, it catches the ribbon of an entire life, pulling out to something like a filmic representation of time: sitting on the real floor with the stage (its centre gutted) dropped around him, a man at a bar is met by the obliging attendants who wait at either end and approach and recede with each swing. The stage pitches left and he is handed a cigarette, right and it is lit for him; a wash basin at one end is followed by a towel at the other. Time passes in the stage's pendulum motion. The man's shirt is taken off and he wears a dressing gown, climbs to the stage; everything is dark, the others have gone. The motion of the flight ruffles his gown like a night wind. The show never allows these moments to settle though; always it is looking to the next trick, to the point that it becomes about the next trick. Why are they pulling up the floorboards? To get at the trampoline. Why is Harrivel threading his feet through loops to hang upside down? For a comic sequence where he mirrors the movements of a man overhead. Why is the stage being winched higher? To make room for the cloudswing. At one point, rolls of greasepaper are suddenly dropped, obscuring the space under the stage and allowing a shadowplay sequence that, as with everything else, is fantastically executed, yet senseless in its larger, theatrical arrangement. And in the end, what does it say? What does any of it ever say? That they are good acrobats. That they have large resources, fine collaborators, an excellent stage. 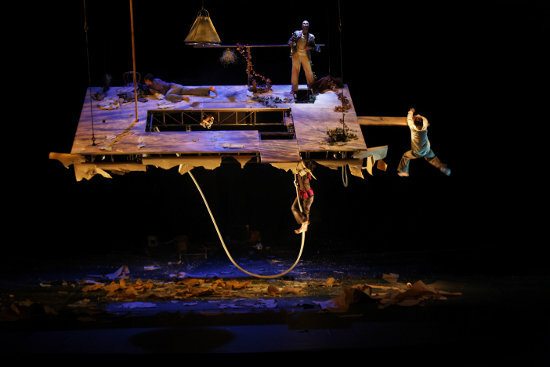 For more on Compagnie MPTA see their interview and profile in the book Panorama contemporain des arts du cirque. For more on Mathurin Bolze see John Ellingsworth's review of his piece Ali in Sideshow Magazine Issue 2.